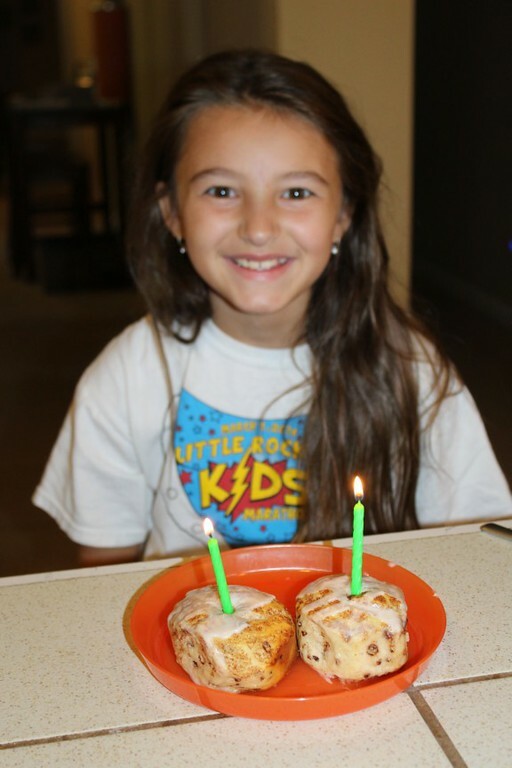 Adventures in Dennieland...: September 12, 2015-Happy 10th Birthday Reagan! When Reagan went to bed last night she said that she was excited about getting to sleep as long as she wanted to this morning and we certainly let her do that since today was her 10th birthday. While everyone was starting to wake up, Robby ran down the road to pick up some biscuits and gravy for himself since he was making the rest of us cinnamon rolls. I guess since Robby doesn't have a wife that knows how to make biscuits and gravy, he will have to settle for breakfast from a gas station. We sang and had candles for Reagan this morning on her cinnamon rolls and then Grannymom and Grandpa showed up to deliver Reagan and then girls throw pillows that Grannymom had made for her. We had found a shower curtain that matched their comforters and the girls were thrilled with how they turned out. Though when it was bedtime, I saw a new pillow fly across the room and when I turned to glare at the thrower of the pillow, Keaton said, "they said they were throw pillows." After Grannymom and Grandpa left, we scurried around and got ourselves ready-as soon as my boys heard me mention that it was time to go, they were ready and in the car. We loaded the car and then were off with a quick stop at the store and then on to the tailgate. The Wilsons had their tailgate set up and we crashed it. We arrived just as they were starting to eat and we joined in for lunch. The kids were so in awe of what all was going on, flying around and places to play that they could hardly eat at all. The kids threw the ball, ran on the green and played hard until pretty much all of them are sunburned a bit tonight. After everyone else had to leave for the game, we stayed and watched a little bit of it on their tv before leaving to take Reagan to a party. I had never been to a real tailgate on the golf course before and goodness gracious-people are quite interesting. But I was really surprised at the number of people who did not go to the game and just stayed at their tailgate parties. Tomorrow is Cate's birthday so her party was today, but they also sang to Reagan and had her a candle to blow out. They had a scavenger hunt which was apparently lots of fun because Reagan talked about it most of the evening long. After dropping Reagan off, we picked up pizza and then ran home for a few minutes. The guys watched some of the game, but the boys soon went upstairs to play their Xbox-I guess that was a good thing because they didn't have to see the Hogs lose! Tonight Robby worked in the garage while I tried to shoot the kids with a nerf rocket and later in the evening I had the kids see if they could drag me out of the house-sometimes I bet Robby feels like he has 7 kids! We put everyone to bed and a bit later, I went upstairs to wish Reagan a Happy Birthday since she was born at 9:12 on 9/12.